An Epic Roasthouse Wedding is most known for its delicious steaks and spectacular window views. Located in San Francisco, the venue provides couples with a lovely space to celebrate their nuptials and entertain guests. Brides and grooms can choose to make use of either the Enclosed Piazza or the Bay Room. The Enclosed Piazza is a private room on the ground floor of the Epic Roasthouse. The walls of this room are made of glass, giving guests a magical view of the night sky as they eat. The Bay Room is located upstairs and allows for a slightly larger reception party. The room is designed in rich colors and is surrounded by expansive windows. These windows look out at the sensational setting of the San Francisco Bay and its magnificent Bay Bridge. 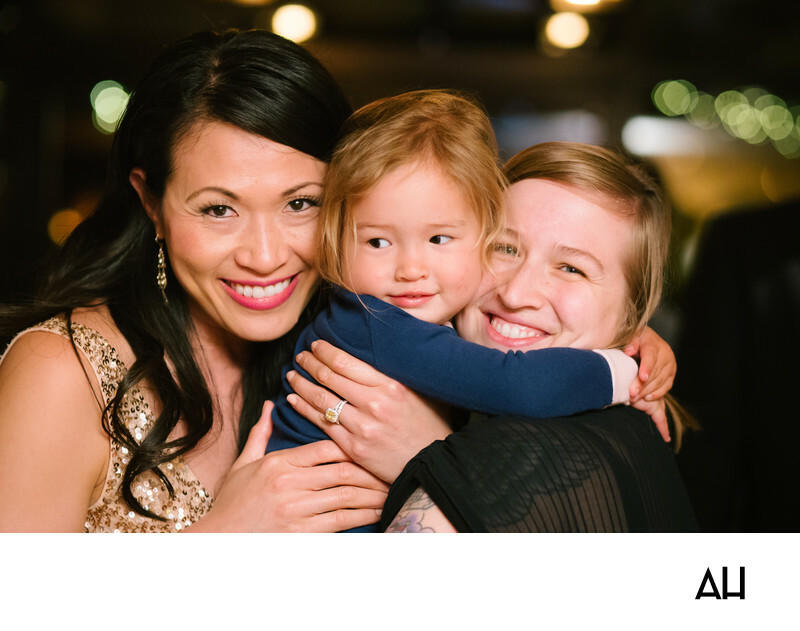 The wedding pictured shows two wedding guests hugging a child, a symbol of the love and incredible joy that permeated the day. The women in the picture smile wide as the lights of the venue twinkle behind them, and the celebration continues on.